Two of my blogging comrades, Jodi and Peggy, have taken up the challenge of helping Fidos and their families get healthy and fit. It's a great goal and I'm totally behind it, so much so that I've donated a prize for their grande prize package and I will be participating in the challenges with Tanner and Oliver. They both voted 2 paws up to get involved! Today I'm here to share some of the K9 Kamp info with you in hopes that you'll join me and my pups in some of the fun. If you're worried about whether you'll be able to handle the "challenges", please don't. I've already been down that questioning road and learned that all the challenges are flexible. Just like some of you, I have my own exercise and health challenges, so our hosts tell me we can all mold them to suit our abilities and our dogs', as well. 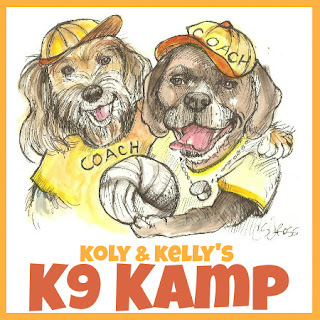 K9 Kamp begins Thursday at Kolchak Puggle and Peggy's Pet Place, and will run through October 13, 2011. Starting with the first challenge on Thursday, there will be increasingly more vigorous activities, along with variations for folks like me who are nursing injuries, or have other challenges to work around. I have to avoid activity during the afternoon heat here in Florida, but the challenges will allow me to pick the time of day or the location, so it's all good. I get the impression we can also substitute more suitable activities, when those suggested don't work for our Fido or us. Safety first! In addition, your pup hosts, Koly and Kelly, and their human companions, Jodi and Peggy, will be offering great information on diet, exercise and low-calorie treat options for all participants. This is sure to be a fun event. Those who make an effort to complete each week's 1-hour challenge will get appropriate entries into the drawing for the grand prize, as well as the opportunity to win weekly prizes. Sounds great, huh?! Each week's challenge will become increasingly more vigorous, yet it sounds like all will remain do-able for even the least active participants. I guess all that is to say that it will start out very tame and build slowly, mainly to make sure that safety and good health are the focus. The idea is to build a habit of engaging in healthy activity and eating right along with your pup--your companion throughout the events. Having two pups, I had to ask if switching off was acceptable. The answer was yes. I guess that means I'll be getting double the exercise of the boys, but I'm sure we'll find ways to work that out. Before I move on, let me tell you about your hosts, Jodi and Kelly. Jodi is the voice behind Kolchack Puggle. She's quite the dog gourmet and is always busy whipping up something in the kitchen for Kol and his new housemate, Felix. Peggy is known for Peggy's Pet Place. Her most recent claim to fame is the publication of her new book, Dieting with My Dog. Her adorable pup, Kelly, is on the cover. I'll post my progress on my own Facebook page also, so if you're wondering how Tanner, Oliver and I are doing with the program, you can check up on us there between our progress reports. Each new challenge will begin on Thursday. Your first challenge will be posted at the hosts' blogs sometime today, and you'll have one week to complete this and each of the challenges. Since the tasks are all intended to be fun and active, the idea is to bond with your dog while working off some calories together. Don't stress out, though; it's only an hour out of your week. No worries; just Fido fun! That sounds like a lot of fun. I look forward to reading about it, and participating. We look forward to participating with you! Lookin' forward to maybe some new things to vary the hikes I take my Humans on every day. Interesting!! 1 hour a week....I think I can handle that since I am back at work. Schooner and Skipper and myself will try. We are so excited to have you, Tanner & Oliver kamping along with us! We can't wait to get started and hopefully meet some new blogger buddies along the way! Thanks for joining us! How is it going? Kelly had her walk today so we're off to a good start.